From Captain's Daughter to Army Mom: I'm Cookie-maker of the Month... No, really! 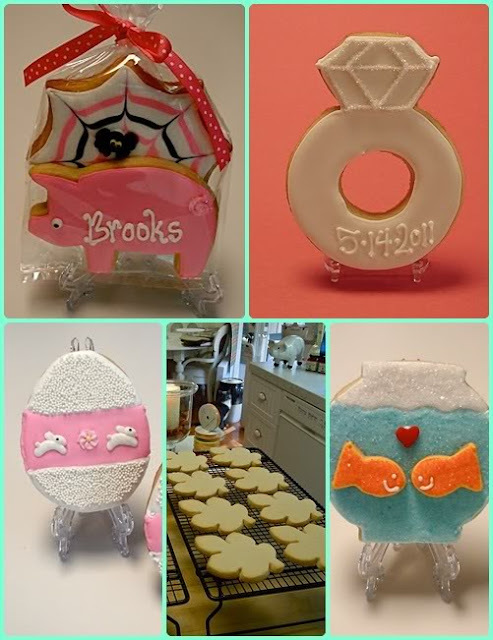 When I received the e-mail last week from my sweet friend, Bridget letting me know that she featured me as Cookie-maker of the month, I almost wished I wasn't on a cruise where there was no Internet access! Seriously, I've been dying to see! Now that I'm baaaack, all I can say is Wow! And, thank you, Bridget! I am humbled by your recognition of my efforts with sugar, and have only YOU to thank for every success I have decorating sugar cookies. I never imagined I would be paid to do something so much fun, which also provides me with such creative outlet. I mean, I have trouble drawing a decent stick-figure, and I couldn't knit to save my life; however, through your patient input and direction, I am able to turn out sugar cookies that taste amazing and look retail/bakery-worthy... Even if I do say so myself! And to you, my dear readers... You already know that every ounce of cookie baking and decorating skill I have came to me via reading Bridget's wonderful blog, Bake at 350 and through the use of heirloom-quality copper cookie cutters I find at CopperGifts. However, what you may not already know is that several months ago, Bridget launched a fantastic cookie-tutorial site, cleverly named University of Cookie. Oh! And, before I forget... There are no dues, fees or text books to buy either... However, I fully expect to see Bridget hosting a book signing of her own one day very soon! What a lovely *thank you* post to Bridget. I was delighted when you were featured as her *Cookie Baker of the Month* Such well deserved recognition of your wonderful and creative talents. While I love your cookies, I also love to see everything you you create in your kitchen and elsewhere in and around your home. Thank you for such a beautiful blog that is such a beautiful and enjoyable place to visit. Oh, aren't you the sweetest, Janet?!? If you could see my cookies from my first year, or two, or three, of cookie decorating, you would know that you have NATURAL TALENT! You picked it up right away! So glad you emailed me a year ago! :) Mwah! Of COURSE you are!! You are AMAZING!!! That's awesome Janet. You are one talented, beautiful and kind lady. You so deserve this. Congratulations! Your cookies are beautiful and amazing! I loved the ones you made at Easter, the Fishbowl, the pig and spider web (loved, loved) and, of course the beautiful wedding ring cookies. Thank you for being so generous and mentioning CopperGifts, we think you are a very sweet Cookie Maker of the Month!